Danny grew up in Baltimore, Maryland, but moved to Southern California in the early 70s to pursue his passion for surfing. During one outing at the beach, he was approached by two young men who gave him a Gospel pamphlet. This was one of the key events that led to his decision to obey Jesus soon after. Out of loyalty to Christ, Danny decided to abandon his lifestyle of recreational drug use. He sought the support of community to maintain this commitment by moving to Shekinah House (an outreach of Calvary Chapel – Costa Mesa). While there, he began to share his faith on the beaches and streets. He also assisted in planting a church (Mission Christian Fellowship) and founded The Land, a Christian community emphasizing evangelism and discipleship. In 1980 he joined Youth With a Mission and continued by training students and sending outreach teams to the South Pacific and Asia. 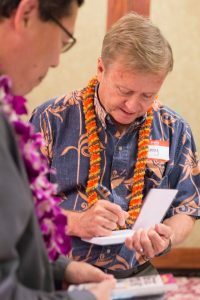 He was appointed director of YWAM Honolulu in 1983, a position he served in until 1997, and again from 2000 to 2001. Danny often is a featured speaker at Calvary Chapel Honolulu and has coordinated the counseling at the Honolulu Harvest Crusades. Danny is the author of three books on evangelism, “For the Gospel’s Sake,” “Bringin’ Em Back Alive” (both out of print) and most recently “Beautiful Feet.” He also has written one book on spiritual discipline, “Before You Hit the Wall,” and another, “STOKED! Firing up your Passion for God.” He also has written evangelistic tracts such as The Facts of Life. His missions awareness radio program, “Word to the World,” formerly aired on the nationwide Calvary Satellite Network. Danny lives in Kailua-Kona, Hawaii, with his wife, Linda and now serves as part of the leadership team for YWAM Kona. His son Daniel also works with YWAM Kona.